Yemen em i kantri bilong kontinen Aprika. ↑ 2.0 2.1 2.2 2.3 Yemen. International Monetary Fund. Retrieved on 2010-04-21. 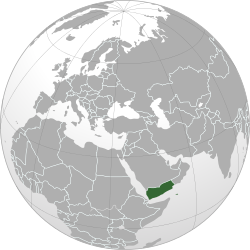 ↑ Human Development Report 2009: Yemen. The United Nations. Retrieved on 2009-10-18. ↑ Yemen. International News Safety Institute. Retrieved on 2009-10-14. This page was last edited on 8 Mas 2013, at 15:09.